Captain Michael Valentine Paul Fleming served with the British Expeditionary Force (B.E.F.) in 1940. He was with the 4th Battalion, Oxford and Buckinghamshire Light Infantry, a territorial battalion, which formed part of the British 48th Division. Michael Valentine Paul Fleming was born on 23 July 1913, the youngest son of Major Valentine Fleming, M.P. and Evelyn Fleming (nee Rose). He had three elder brothers: Peter Fleming (1907 – 1971), Ian Fleming (1908 – 1964) and Richard Fleming (1911 – 1977) and a younger half-sister, Amaryllis Fleming. All four brothers served in the Armed Forces during the Second World War: Ian Fleming in the Royal Navy and the others in the Army. Peter Fleming was a famous explorer and author. Ian Fleming was also an author and is best known as the writer of the James Bond series of books and the children’s story “Chitty-Chitty-Bang-Bang: The Magical Car.” Amaryllis Fleming, who died in 1999, was a world famous cellist. Major Valentine Fleming (1882 – 1917) was a barrister by profession and Member of Parliament (Conservative) for Henley, Oxfordshire between 1910 until his death in 1917. At the outbreak of war in 1914, Valentine Fleming joined the Queen’s Own Oxfordshire Hussars and served on the Western Front. He was killed in action in France on 20 May 1917. Valentine Fleming’s eulogy was written by fellow M.P. and army officer Winston Churchill, who became Britain’s Prime Minister during the Second World War. As a serving Member of Parliament who died in the First World War Valentine Fleming is listed on the WW1 memorial in Westminster Hall, the oldest surviving part of the Palace of Westminster [Photograph No. 1]. “ … Valentine Fleming was one of those younger Conservatives who easily and naturally combine loyalty to party ties with a broad liberal outlook upon affairs and a total absence of class prejudice. He was most earnest and sincere in his desire to make things better for the great body of the people, and had cleared his mind of all particularist tendencies. He was a man of thoughtful and tolerant opinions, which were not the less strongly or clearly held because they were not loudly or frequently asserted. He had everything in the world to make him happy; a delightful home life, active interesting expanding business occupations, contented disposition, a lovable and charming personality. He had more. He had that foundation of spontaneous and almost unconscious self-suppression in the discharge of what he conceived to be his duty without which happiness, however full, is precarious and imperfect. That these qualities are not singular in this generation does not lessen the loss of those in whom they shine. Like his other brothers, Michael Fleming was educated at Eton and became a stockbroker. Before the Second World War he became a Territorial, joining the Oxfordshire and Buckinghamshire Light Infantry (Ox and Bucks). In mid-January 1940, while serving with the 4th Battalion Ox and Bucks, Captain Michael Fleming went to France as part of the British Expeditionary Force (B.E.F.). The 4th Ox and Bucks was part of the 145th Brigade in the 48th Division. Disembarkation of the 145th Brigade was completed by 18 January and the 4th Ox and Bucks were deployed in the Thumeries / Attiches area, a short distance to the south of Lille and not far from the French border with Belgium. From 18 January 1940 until 14 May 1940 the Officers’ Mess for the 4th Ox and Bucks was the Grand Château on the Rue du Moulin, Attiches. Photograph No. 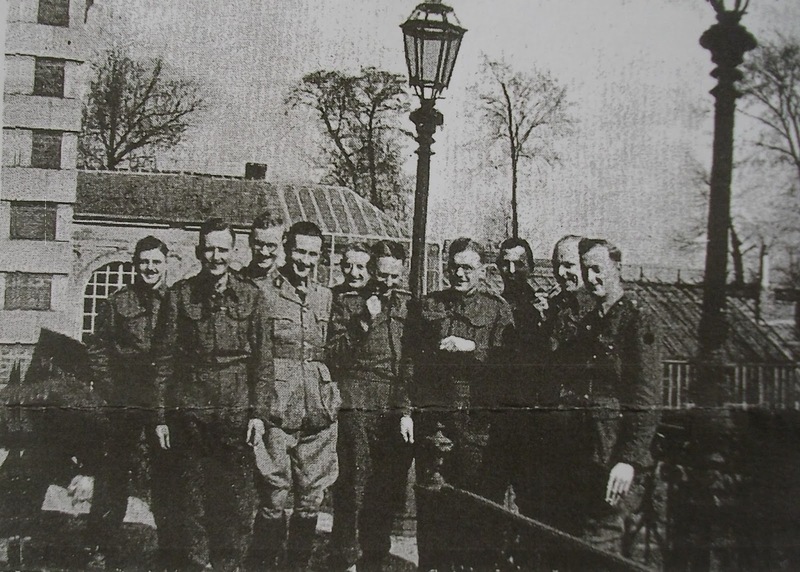 2 (above) shows some of the 4th Battalion officers in the grounds of the Attiches château with Captain Michael Fleming (Adjutant) on the extreme left. The other officers seen in this photograph are, left to right: 2nd Lt. R.D. Purchon (Company Officer, “A” Company), Lt. M.G. Duncan (Transport Officer), Captain J.A. Gordon (O.C., “H.Q.” Company), the French ‘Agent de Liaison’ (name unknown), Captain D.H. Whinney, Lt. E.C.A. Keen (O.C. “B” Company), Lt. R.E. Munsey (Mortar Platoon), 2nd Lt. S.H. N. Ruck Nightingale (Company Officer), Captain N.R. Landsell (R.A.M.C., Medical Officer), 2nd Lt. J.H. C. Clerke Browne (Company Officer). As 2nd Lt. Purchon was posted to the battalion on 12 March the photograph would have been taken between that date and the end of March. Following the German invasion of Belgium and the Netherlands on 10 May 1940, the 4th Ox and Bucks were mobilised and left the Thumeries / Attiches area and advanced into Belgium. Initially the battalion took up defensive positions in the Soignies Forest near Brussels. When the news came through that the enemy had broken through on their right flank, the 4th Ox and Bucks were ordered to withdraw, initially to Halle to the west of Waterloo (Belgium). The ‘Exodus’ towards the coast was fraught with difficulty. For a time, the 4th Ox and Bucks held a position between Hal and Enghien before being ordered to withdraw again towards Ath, a little to the east of Tournai. The roads were congested not just with soldiers withdrawing but civilians attempting to flee to safety. This ‘Exodus’ was not just the road to the coast but also a ‘road to hell’. There were further withdrawals and defensive stands for the 4th Ox and Bucks with many casualties: Tournai, the canal at Bleharies (where 48 men of “A Company” alone were lost) and then through Flanders towards the coast. The 48th Division, including 4th Ox and Bucks, were ordered into reserve west of Poperinghe close to where the B.E.F. of the 1914 – 1918 war had been based. On 24 May 1940, 4th Ox and Bucks were ordered to be ready to move towards Calais and reinforce its defence. However, together with the 2nd Battalion of the Gloucestershire and the East Riding Yeomanry, the 4th Ox and Bucks were ordered to Cassel to defend the ground south of Dunkirk and allow ‘Operation Dynamo’: the evacuation from the Dunkirk beaches. The 4th Ox and Bucks, the 2nd Glosters, with the E.R.Y. on the Mont de Recollets to their left, held the perimeter at Cassel at the end of May while preparations were made for the evacuation from Dunkirk. During this time there was incessant shellfire from the enemy. It was a desperate time. By the end of the battle Captain Michael Fleming had been ‘mentioned in despatches’ three times. By the following day, 29 May 1940, the town of Cassel was surrounded. The Ox and Bucks were ordered to abandon Cassel and march to Dunkirk by a road that was believed to be clear of the enemy. However, this was not so and the bulk of the battalion marched in single file through woods. By this time the Germans were everywhere with tanks, guns and mortars while the 4th Ox and Bucks were but lightly armed. Nevertheless, despite the inequality in armaments, the fighting continued. There were many casualties, killed and wounded. Among those killed was the 2 i/c, Major Joseph Thorne (29 May 1940). Among the seriously wounded was Captain Michael Fleming. He suffered a very severe ‘gun shot’ (shell splinter) wound in his left thigh. The C.O., Lt Col Geoffrey Walsham Kennedy, was also wounded. Captain Fleming and Colonel Kennedy were among those left behind and taken prisoner by the Germans and initially treated at a P.O.W. hospital at nearby Zuydcoote. Despite Operation Dynamo, the Dunkirk evacuation, many Allied servicemen were left behind. Among them were the seriously wounded who initially were cared for in P.O.W. hospitals, such as the one at Zuydcoote. A few weeks later, in July 1940, many of them were transferred to other makeshift hospitals further away from the coast – some to near Tournai, Belgium and some to Lille, France. It was to a P.O.W. hospital at Lille (the 17 / 21 British General Hospital) that Captain Michael Fleming was taken. He was in great pain and unable to The wounded were mainly cared for by British RAMC P.O.W.s and the C.O. was Colonel Robertson, D.S.O. Among the other Medical Corps staff at the hospital were Major C.W. Kimbell and Captain John Heslop, M.C. They were assisted by French civilian nursing staff, orderlies and cleaners. 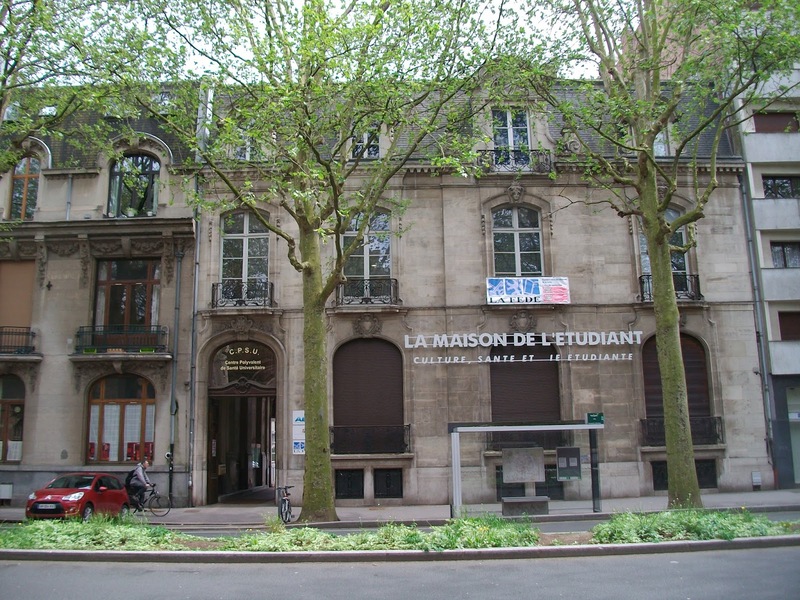 Some of the wounded prisoners were initially housed in a convent on the Rue Roubaix but for the most part they were housed at the 'Faculté Catholique', known locally in Lille as the "Catho". ‘Other ranks’ were accommodated in the chapel while officers occupied what had been staff or student rooms. Most of these buildings still exist (e.g. Photograph No. 3). The building seen in photograph No. 3 is in across the road from the “Catho” chapel. Among the other British officers known to have been cared for at the “Catho” at Lille in the summer of 1940 were Lieutenant (later Lieutenant Colonel) Jimmy Langley, Lieutenant (later Lieutenant Colonel) Charles S. Madden, Lieutenant (later Major) Airey Neave and Major John Surtees (“the gallant defender of Calais”). Jimmy Langley, despite having his left arm amputated by a German doctor before arriving at Lille, escaped from the hospital on 5 October 1940. After hiding in the Lille area for some days he next went to Paris and then to Marseille in the Vichy ‘Free Zone’. At Marseille Jimmy Langley was interned at Fort Saint-Jean although allowed a great degree of freedom. With the help of the developing escape and evasion network that became known as the “PAT” line, Jimmy Langley managed to get repatriated in March 1941. He was then asked to look after the escape lines of N.W. Europe and was in charge of I.S. 9 (d), known as “Room 900”. Airey Neave, after making a sufficient recovery in the hospital at Lille, also made an escape attempt. Eventually, he was recaptured and subsequently sent to the infamous prison camp at Colditz Castle. He would go on to become the first British officer to make a successful ‘home run’ after escaping from Colditz. After reaching London, Airey Neave became second in command to Jimmy Langley at “Room 900”. Because of his severe leg wound, Captain Michael Fleming was unable to walk unaided and was largely confined to his bed. Hence, escape was never an option. The conditions at this P.O.W. hospital were far from ideal. Everything was in short supply – including food, clothing and medical supplies. Most of the wounded P.O.W.s who were not bedridden were still wearing their bloodstained uniforms weeks after being wounded. “… in the summer of 1940, I had been brought with other wounded from Calais to the Faculté Catholique, a school in Lille, converted into a hospital for British prisoners-of-war. A sombre, red-brick affair with stone floors and a smell of wounds and disinfectants. I could see Langley, pale and strained, playing cards in one of the wards. I remembered his high forehead and bright eyes as he sat on his bed dressed in a tattered shirt and trousers. Three months after our capture we were still in our bloodstained uniforms. [From: Neave, Airey (1969) ‘Saturday at M.I.9.’, Pen & Sword, Barnsley, page 59]. 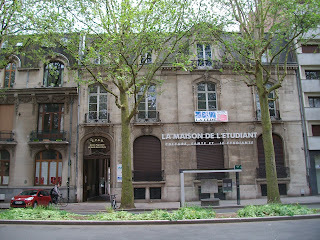 There was even a shortage of blood supplies at the Lille “Catho” while it was being used as a hospital. This was especially serious situation when it was deemed necessary to operate on one of the prisoners. Some of the French Red Cross nurses assisting at the hospital also gave blood donations. Captain Fleming’s wounds took a turn for the worse while he was still in hospital at Lille. According to the wartime personal testimony of one of the Red Cross nurses, Sister Olga Baudot de Rouville, it was one of her colleagues, Adèle Gros, who donated blood for Michael Fleming’s operation. Ultimately, the operation was unsuccessful and Michael Fleming died on 1 October 1940. “I first met Michael Fleming in late July or early August when I was transferred from the P.O.W. Hospital at Zuydcoote near Dunkirk to that at the Faculté Catholique, Boulevard Vauban, Lille which was a 'staging' hospital for the badly wounded until they were, as the Germans put it, fully 'transportable' for Germany. The medical staff were all R.A.M.C. with occasional visits by the German doctors to assist when individuals were fit to be sent to Germany. Orderlies, other than the medical, were French other ranks who were responsible for cooking, cleaning the rooms, etc. Michael, until a day or two before his death, was in a room with four or five other officers but the only name I can remember is that of Colonel Kennedy who had been his C.O. in the Ox. and Bucks. Possibly however, Airey Neave and John Surtees may have been in the same room. Michael had a very severe 'gun shot' wound in the left thigh and was unable to walk unaided. It was the habit of the walking wounded to pass most of the day visiting those confined to bed, largely for a good gossip or to disseminate the latest rumours on B.B.C. news, but occasionally to play cards or distribute books in English, abandoned by the B.E.F. As one of the latter, I got to know Michael quite well since we had friends in common and at least on one occasion were in the same group that went by truck, under armed guard, to be 'X-rayed' at a French hospital. He must have been in considerable pain when carried around on a stretcher or jolted in a truck but he certainly never showed it. In bed he was always cheerful and joined in the general discussion, arguments, etc, which included gently nagging Col. Kennedy. The 'Retreat to Dunkirk' was very rarely, if ever, talked about, except to enquire as to news of mutual friends. I have no knowledge as to where Michael fought, the circumstances in which he was wounded and captured, or how he arrived at the Faculté Catholique. When we met I knew nothing of his background or family life and cannot remember much of what we talked about but I have a vivid recollection of his devotion and adoration of his mother and all she did for him and his brothers. For the rest of the war, Captain Fleming’s grave was marked by a wooden cross. At the end of the war the cross was replaced by a standard War Graves Commission headstone. Photograph No. 4 is a recent photograph of Captain Fleming’s headstone in Lille Southern Cemetery. It is believed that one of the Red Cross nurses who tended Michael Fleming in his last days at Lille, the aforementioned Sister Olga Baudot de Rouville, wrote to Captain Fleming’s wife, Mrs Letitia Fleming, shortly after his death. Sister Baudot de Rouville served as a member of the French Resistance in a number of locations throughout France. After returning to Lille towards the end of the war, in 1945 she wrote again to Captain Fleming’s widow enclosing a photograph of the headstone which had just been erected. She also asked if Mrs Fleming could send her a photograph of Captain Fleming so she could remember him. The letter was sent to the address Sister Baudot de Rouville had obtained for Mrs Fleming in 1940 and which was written in her post-war diary / address book [Photograph No. 5]. This pocket diary / address book has the names and addresses of various former Allied P.O.W.s and some who, like Sister Baudot de Rouville, had been in the Resistance. The address that Mrs Letitia Fleming and her children had been living in 1940 was at Merrimoles House, Nettlebed, Oxfordshire. This was actually the home of Michael Fleming’s elder brother Peter and his wife, Mrs Celia Fleming. better known as the celebrated actress of stage and screen, Dame Celia Johnson). “I am so grateful to you for your thoughts & specially for sending me the photographs of Michael's grave. I am so glad they have changed the cross for a white one. My brother-in-law Richard Fleming arranged for that to be done, when he passed through Lille on his way to Holland last summer. From what you and so many people have told me, I am quite convinced that every possible thing was done for my beloved Michael & that when he died he was not lonely as he had won the hearts of all who had any contact with him. …. Below is the CWGC citation for Captain Michael Valentine Paul Fleming (which incorrectly gives his age as 28 when he was actually 27). Regiment/Service: Oxford and Bucks Light Infantry 4th Bn. Grave Reference: Plot 5. Row B. Grave 29. Cemetery: LILLE SOUTHERN CEMETERY, Nord, France. Son of Major Valentine Fleming, D.S.O., Queen's Own Oxfordshire Hussars (killed in action in France 20th May, 1917), M.P. for South Oxfordshire 1910-1917, and Evelyn B. Fleming; husband of Letitia Fleming, of Nettlebed, Oxfordshire. Died: 1 October 1940 (Lille, France). “A true gentleman, gallant and brave to the end, who won the hearts of all who knew him”. @ritsonvaljos Thanks for the info. An interesting read.